Your basic beginner tools are to tighten/loosen three things on your skates: 1) the aforementioned toe stop nut, 2) the axel nuts, which are the nuts that hold your wheels on their axels, and 3) the action nuts, which are the nuts that hold the trucks on your plates. Pretty basic, so you don't need to spend a lot of money a tool that's, you know, sentient. Or sonic, for you Doctor Who geeks. 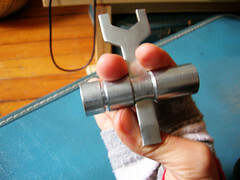 I have a 4-Way Elephant tool and a toe stop wrench. I think Riedell skates come with a Riedell skate key, which does all three things. 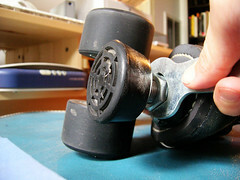 There's also the PowderDyne skate tool, a three-in-one tool that's not too expensive. This is a kayfabe shot, you actually have to hold the toe stop with one hand and tighten the nut with the wrench in the other hand. But you know, my one hand is holding the camera. 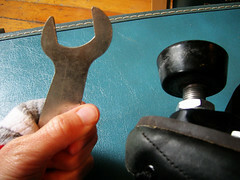 Screw in the toe stop to the desired length by hand, then tighten the toe stop nut as tight as you can with the wrench. What the desired length is up to you, I wear mine sort of low to help me with my toe runs. It puts me in a little danger of tripping on my own toe stops, which you probably don't want. Not that I want to trip on my own toe stops. Anyway for now, the factory length is probably fine for you. 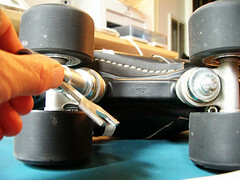 You want your wheels to spin freely around the axel, but not move up and down the axel much at all. What I do is, I tighten them until they don't spin & then loosen them a quarter turn at a time until they do spin. In fact when you skate, your wheels don't roll straight forward; if they did, it would be pretty hard to do anything but skate straight forward & sometimes you want to, you know, turn. Instead when you turn, you put your weight into the turn and your wheels flex in that direction & viola, you turn. (I know it's voila.) The tighter your trucks are, the less they flex & the looser your trucks are, the more they flex. Therefore the tighter your trucks are, the less responsive they're going to be to your weight & the looser your trucks, the more responsive. And neither is good or bad, it just has to do with how you're skating & what you need. If you feel all over the place, you may want to tighten your trucks for more stability. If you feel like you can't turn to save your life, you may want to loosen your trucks to give yourself more mobility. 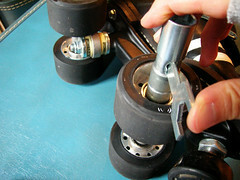 Tighten or loosen all of your trucks a quarter- or half-turn at a time, until you feel comfortable in them. Try to adjust the front and back trucks evenly.